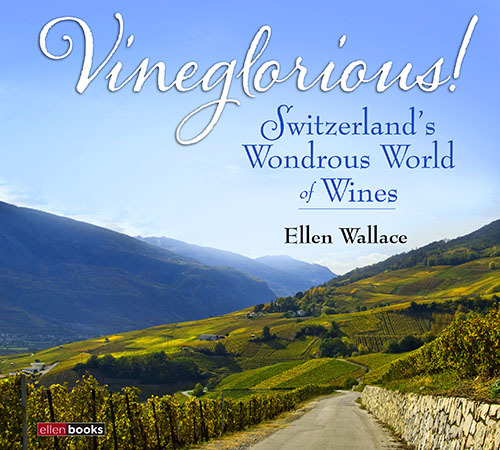 book signing Ellen Wallace wine book Vinea Swiss Wines Fair Vineglorious! 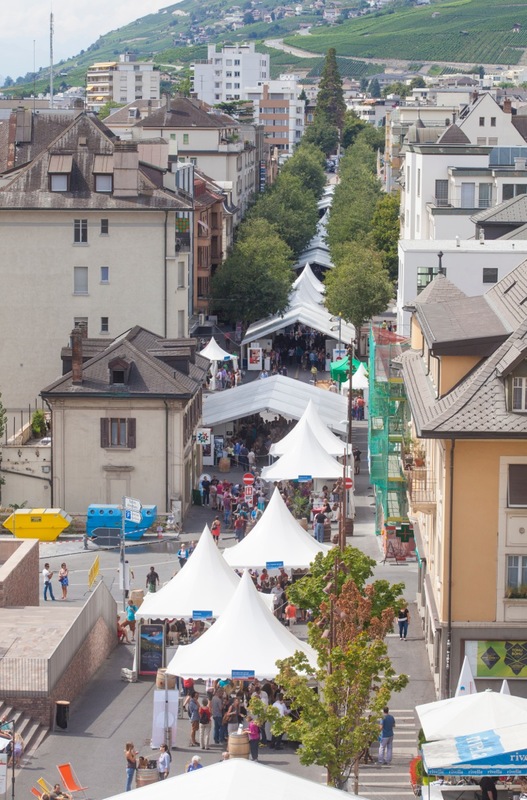 This is Switzerland’s largest outdoor wine fair, a wonderful chance to sample wines from throughout the country, with the weather invariably beautiful (fingers crossed in this rainy year!) and opportunities to do a number of interesting related activities. Your CHF30 entry gives you a glass that you can keep as a souvenir, and the right to taste all the wines you can manage, out of the 1,500 or so available. Part of what makes it fun is that most people are there to really learn about wine and find their favourites, so there is very little drunkenness, and quite a few cheerful people by the end of the day. It opens Friday night 5 September and runs through Sunday 6. First book in English on Swiss wine in 20 years! I will be signing my book, Vineglorious! Wondrous Swiss Wines, at the fair Saturday from 16:00-18:00. It is the first book in English on Swiss wines in 20 years, a period rich in change and major improvements. This is the perfect gift book for yourself or anyone who loves wine and/or Switzerland! The book will sell (cash only) for CHF24, a CHF6 saving over the online ordering cost where you must pay handling and shipping. This is the 21st year for the wine fair, which includes a number of events in and around it. They include: introduction to wine tasting for young people, games and competitions (smells and Swiss grape varieties, syrups tastings, AOC-PGI products, surprise ideas from Passport Valaisan, hikes in the vineyards, photo exhibits, book signing, etc. – three days of festivities, meet-ups and fun! 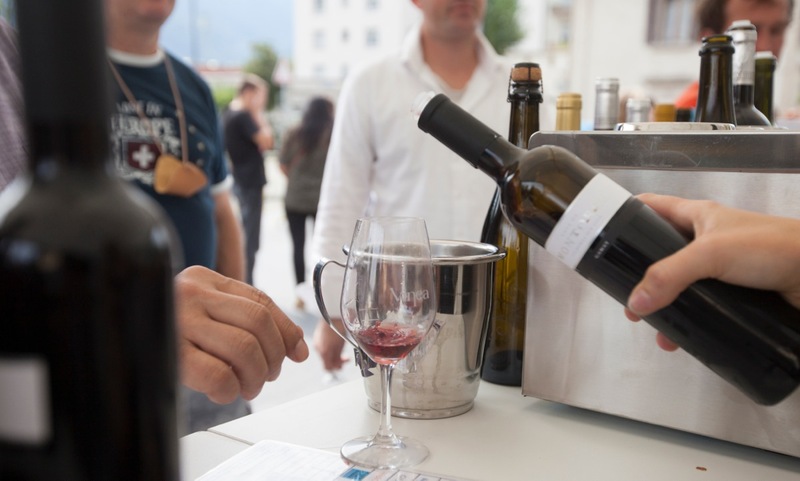 The fair in Sierre showcases Swiss wines through a number of the industry’s associations, such as Ticinowine, Schaffhauser Blauburgunderland, Clos, Domaines & Châteaux (with Grands Crus from more than 20 wineries in Canton Vaud). Wine producers from Neuchatel, Geneva, Ticino and canton Vaud are also taking part – and, of course wineries from Valais will be present. This is truly a three-day tour of Switzerland through its wines, with wines from more than 150 producers who are taking part either individually or through their associations. Vinea, alongside its work organizing the September wine fair, has developed great expertise in organizing international wine competitions, notably the Mondial du Merlot and the Mondial des Pinots. New this year: visitors will have the rare privilege of discovering and trying, at no extra charge, the Merlots and Pinot wines from Switzerland that won awards during these competitions. They are also invited to test their knowledge against that of professionals, Saturday 6 and Sunday 7 September from 11:00-13:00. The 2014 Mondial des Pinots has just taken place, 15-17 August in Sierre. Prizes will be announced 5 September during the opening of the 21st Vinea Swiss Wines Fair. As part of the new approach undertaken last year, VINEA has become more involved in gastronomy. Visitors looking for a nibble of something will be happy to find fun little gourmet snacks prepared by our partners: Didier de Courten in the Sierre producers’ tent; Café des Amignes with Vétroz Grands Crus wines; Canard Gourmand with its foie gras in the Vaud producers’ tent; and running the length of the tents, Sbrinz and dried meats from Valais, made by Fleury, as well as the must-have raclette from the Château de Villa, which is taking part in the fair. Those who want to take home a souvenir from the wine fair in a more tangible form will find boxes offered at the stands of several producers, with one white and one red wine. Coupons for CHF30, which are sold at the entry, can be exchanged at the stands of producers who are taking part in the offer.